Were there any mentions of the Holocaust in Churchill et al? Re: Were there any mentions of the Holocaust in Churchill et al? Have you found a photo of a Jew in an alleged gas chamber? The source of this atrocity propaganda sent to zionist stooge Winston Churchill, was not only a zionist, Jewish financier and industrialist, but Henry Mond was descended from a German Jew. He was the grandson of the German-Jewish industrialist Ludwig Mond (1839-1909) who left Germany for England in 1862. What a peculiar ‘communication' to send. “...about German plans for the massacre of the Hungarian Jews” means it hasn't occurred yet. So there is an inherent contradiction there, as he then wrote: “It has been done by scientific machinery” which means it has occurred already. And exactly what “scientific machinery” could he have been referring to? This may be an example of Churchill's well-known devious method of preparing future material for his planned memoirs, by writing his version of events to other politicians and general staff which he can then refer to authoritatively by writing “as I wrote to the leader of the opposition at the time” or “as I wrote to Lord Melchett...” etc. In this instance it appears to be based upon atrocity propaganda that he received from Lord Melchett, which we now know to be false, and which wasn't included, except in the appendix. This false “scientific machinery” claim WAS NOT included in his six volume history of WW2. It only appeared in an appended collection of excerpts from his "directives, personal minutes and telegrams" added at the end of the book. Plus, there it is incorrectly stated as being a communication to Anthony Eden (who became the Earl of Avon), not to Lord Melchett (Henry Mond), unless he was sending the same information to numerous people, and had ALSO sent it to Anthony Eden two days previously. In the 1986 Mariner Books publication, its on p. 597 and is taken from the third appendix (appendix c),. It is an excerpt from a letter to Anthony Eden the British Foreign Secretary dated 11th July 1944. So it is NOT something that Churchill himself wrote in his book on the history of WW2. So Prof Lynn or Faurisson or whoever it was who actually checked the memoirs of De Gaulle, Eisenhower and Churchill may well have been correct. ( I don't know as I have not read any of the three memoirs). Nor is it something that Churchill incorporated from the writings of his researchers and ghost writers into his description and explanation. It's taken from an appended collection of excerpts from his "directives, personal minutes and telegrams" added at the end of the book. 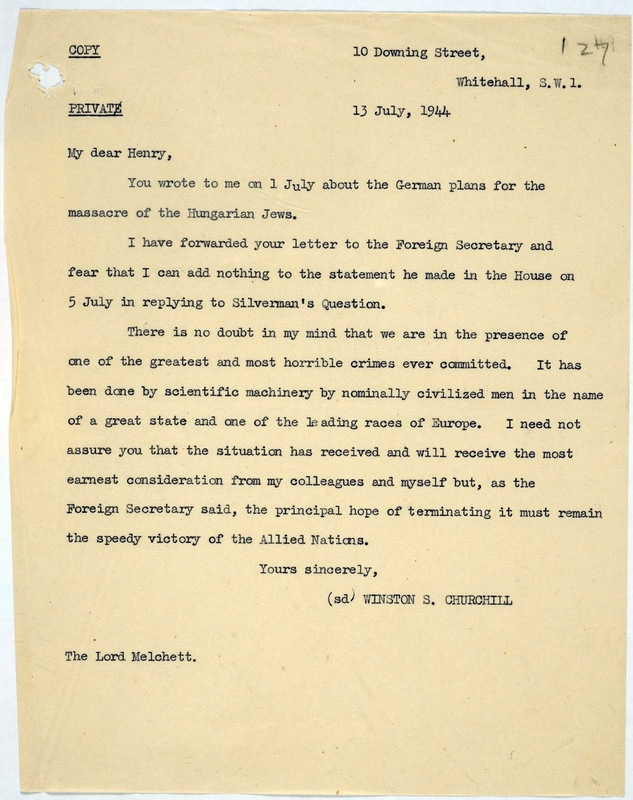 And this may be a curious and revealing anamoly that the evidence you have provided shows who this claim of massacre with scientific machinery had come from: “My dear Henry, you wrote to me on the 1st of July about the German plans for the massacre of the Hungarian Jews”. It had come from Mond. And Henry Mond (Lord Melchet) was another close associate of Churchill's who was a financier AND a zionist Jew who worked for the theft of territory for Europian Khazar Ashkenazi Jews. Thanks for that dissection, been-there. Very informative. Sounds like a Holocaust to me, doesn't it? No. The term holocaust is employed to deify the event. There was no burnt sacrificial offering dedicated exclusively to "God". Just as Noah certainly did not pair up the animals two by two. One of the most sinister aspects of the expulsion policy is the fact that in the course of its execution apparently several million human beings have been "lost." At least, they cannot be accounted for by any statistics now available. Recent census figures for the four zones of Germany, including Berlin, reveal a total population of approximately 66.6 million. Yet, on the basis of prewar statistics, Germany should have a total population of 76.5 million, after the completion of expulsions from Northeastern Europe, Czechoslovakia, Hungary, and the Balkans. German military losses during the war are estimated at 3.6 million and civilian bombardment victims at half a million. This total loss of 4.1 million, however, was at least three-quarters offset by the high birthrate during the first years of the war. This would give Germany a present population of 7S.4 million, from which 4 million, still held as prisoners of war, would have to be subtracted. "I am particularly concerned at this moment with the reports reaching us of the conditions under which the expulsion and exodus from the New Poland are being carried out. . . enormous numbers are utterly unaccounted for. Where are they gone and what has been their fate? .. . Sparse and guarded accounts of what has happened and is happening have filtered through, but it is not impossible that a tragedy on a prodigious scale is unfolding itself behind the iron curtain which at the moment divides Europe in twain." Unfortunately, it must be presumed that a very large percentage of those missing have been put to death by their tormentors or have perished for want of food and shelter. Senator Capehart, according to the ConGressional Record of February 5, 1946, estimated that as many as three million human beings may have perished in the process of a "transfer" that was to have been "orderly and humane." Countless others are known to be held as slave labor in Russia, Poland, Czechoslovakia and the Balkans. The January 1947 issue of the Review Of World Affairs (London) reported that thousands of German women are known to be working as slaves in the mines near Sverdlovsk. Tens of thousands of civilian slaves are working in the mines of Upper Silesia. Czechoslovakia is retaining about 300,000 Sudeten-Germans as slave laborers. The matter would seem to warrant at least a thorough investigation by those Powers who really believe that the war was fought for freedom and against slavery. I am not absolutely sure that we should be in too great a hurry to give up the idea that European Jews may live in the countries where they belong. I must say that I had no idea, when the war came to an end, of the horrible massacres which had occurred; the millions and millions that have been slaughtered. That dawned on us gradually after the struggle was over. But if all these immense millions have been killed and slaughtered, there must be a certain amount of living room for the survivors, and there must be inheritances and properties to which they can lay claim. Three and a half million Polish Jews are said to have been actually slaughtered. It is certain that enormous numbers have perished in one of the most horrifying acts of cruelty, probably the most horrifying act of cruelty, which has ever darkened the passage of man on the earth. I'm not responsible for Churchill's shady doing there, he was with the govt there, classified information is classified. That he said that a genocide occurred, is all I need to know. I thought the thread was self-explanatory, but just in case: I am here to prove that Churchill did mention the Holocaust in his memoirs, as I've seen the claim that he didn't 6 000 000 times already. He did refer to the Holocaust in his memoirs, but not in the extract you've quote-mined and completely misrepresented; he's not specifically referring to Jews there, he doesn't mention "Jews" in that chapter, Nathan. Am I an Armenian Genocide denier, then? "Three and a half million Polish Jews are said to have been actually slaughtered. It is certain that enormous numbers have perished in one of the most horrifying acts of cruelty, probably the most horrifying act of cruelty, which has ever darkened the passage of man on the earth." Odd there's no mention of "gas chambers." "Systematised" is likely referring to the means of transportation. The rest is the end result of a game of Chinese whispers. Odd that Churchill wouldn't mention gas chambers in his memoirs but then mention the murder of 6 to 7 million people in an opening about WW2. An OPENING, not a section, an OPENING. That he considered it to be worthy of mentioning in an opening of a series of Volumes shows that he thought of it significantly. Besides, find me where Churchill mentions Auschwitz in that quote, didn't exist if he didn't. Even more odd that 'systematised' would refer to mere transportation but then be followed by the murder 6 to 7 million people. Gee, was Churchill schizophrenic or what? I mean, if Churchill was a parrot, then what did he parrot? Like, what is even your point? I'm at a genuine loss. Holocaust can be used to describe an atrocity that supersedes all others in cruelty, intent, orchestration, etc., or suffering. There's no religious motive here, buddy. Call it Holocaust or whatever, mass murder (genocide here), is mass murder.